Take a step forward when you cannot decide in which direction you go. When you don't know your path. When you don't know your destination. Life is very complex and more complex is the life of a person. There are moments of irresolution and indecisiveness. But you can't STOP. You have to move on. You have to go somewhere. And this you know. The solution is that you change your position. 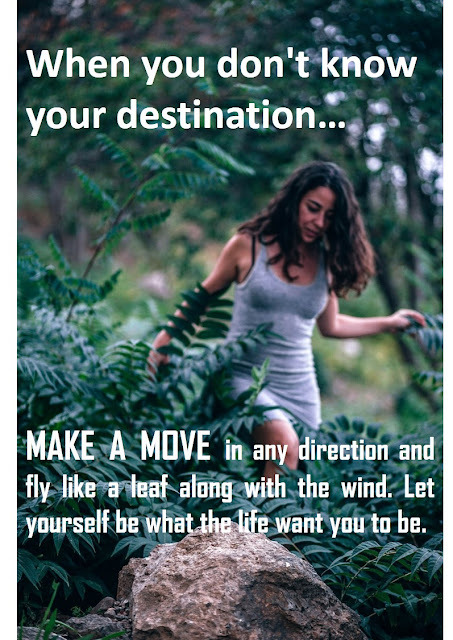 Make a move in any direction and fly like a leaf along with the wind. Let yourself be what life want you to be. You will surely get a way, find a goal to achieve, a destination to reach.